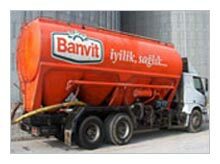 We are engaged in manufacturing, supplying and exporting the best Bulk Feed Tanker. Our Bulk Feed Tanker vehicle is used for carrying the bulk feed or material. Direct loading in bulk feed or materials tanker and unload the bulk feed or materials by tanker conveyors till 35 feet height. With Bulk Feed Tanker, feed millers and customers can save loading, unloading, packing and Ginny bags expenses.